¡Equipados para leer! provides high-quality classroom libraries and Read Aloud training for K-3 teachers. 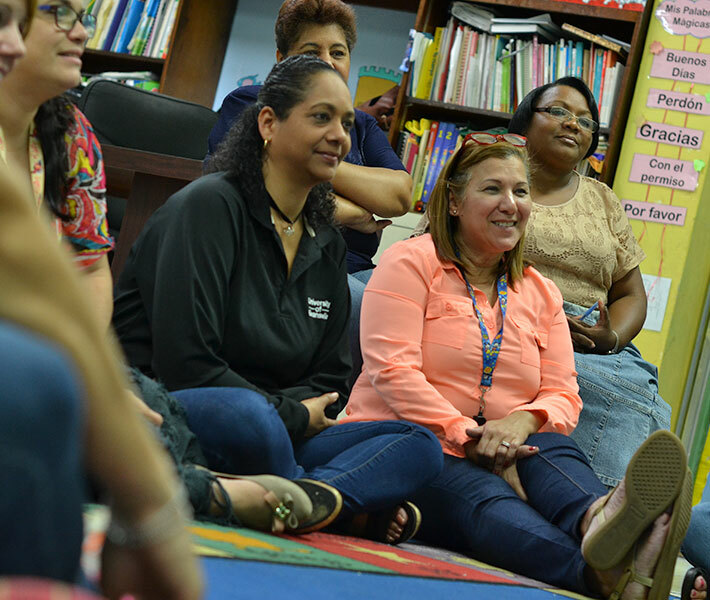 Each classroom library is built of high-quality books that meet international literacy criteria, are aligned to Puerto Rico Department of Education standards and are culturally relevant. In addition to their classroom libraries, participating teachers receive a year-long training program in the practice of reading aloud. The program provides hands-on workshops on best practices and a virtual community in which teachers receive feedback from Flamboyan facilitators on their read alouds and share best practices with other teachers. Take a look at what it’s like for program participants. Teachers who participate in ¡Equipados para leer!, are better able to understand the importance and the benefits of read alouds to promote the love of reading among students, conduct daily read alouds with high-quality books, understand the characteristics of both fiction and non-fiction books, and improve their ability to create questions that promote a fun dialogue with their students after their read alouds. I appreciate this experience and project very much. I think the island needs it more than ever. This year has been very complicated and these books have helped us learn and talk about certain things that, due to the lack of resources such as electricity and internet, we wouldn’t have been able to. It has inspired me to read more, write more and talk more with my students. A million thanks! Our teachers and their students really are Equipped to Read! 100% of teachers who participated in our ¡Equipados para leer! program completely agreed that workshop content was useful to their practice.